Identifying biochemical and anatomical markers of resistance in grape, almond, and pistachio wood. 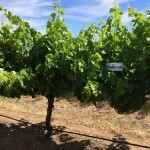 The use of varieties resistant to trunk pathogens could mitigate some yield losses encountered by the grape, almond, and pistachio industries. The goal of our research is to identify resistant varieties and to understand the basis of resistance. Rohslausen discusses how cell wall chemical composition and differences in wood anatomy could be responsible for variance in susceptibility between different cultivars. Goal – Identify new commercial cultivars with resistance to the most aggressive causal agents of Panicle blight of pistachio. Evaluated resistance in all susceptible tissues (green tissues: panicles & fruit, woody tissues: stem) with the three most aggressive pathogens (Botryosphaeria dothidea, Neofusicoccum mediterraneum, and Lasiodiplodia citricola), either alone or in combination. Inoculations were done on mature trees in an experimental orchard. To identify resistant germplasm, stem inoculations are required. Inoculation of green tissues leads to blighted panicles and fruit. However, results were not different among cultivars and all three pathogen species colonized equally. 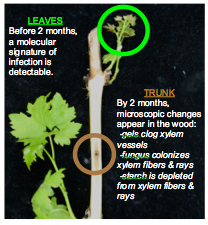 In contrast, inoculation of stems lead to cankers of different lengths, depending on the cultivar and the pathogen. Kerman, which makes up >90% of California pistachio acreage, showed an intermediate level of resistance, with cankers ranging from 5 to 20 cm. 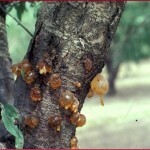 Even more resistant (i.e., with smaller cankers) were new cultivars Golden Hills, Lost Hills, and Randy. New cultivars Kalehghouchi, Joley, and Aria were most susceptible than Kerman. 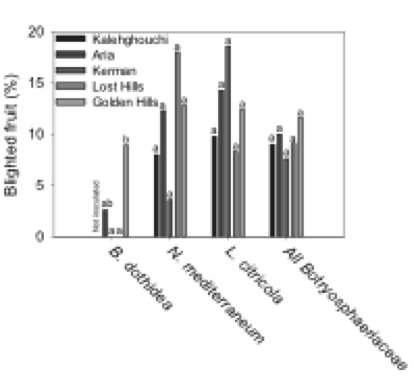 Among the pathogens, Lasiodiplodia citricola was the most aggressive species (i.e., caused the largest cankers) on all seven cultivars, including Kerman. 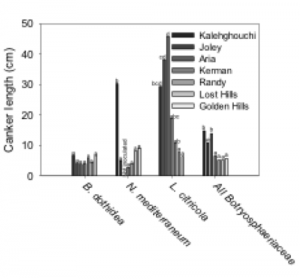 Several new cultivars – Golden Hills, Lost Hills – are more resistant than Kerman. The inoculation method we developed will be important for evaluating preventative fungicides, esp. given that even the most resistant cultivars still develop cankers. 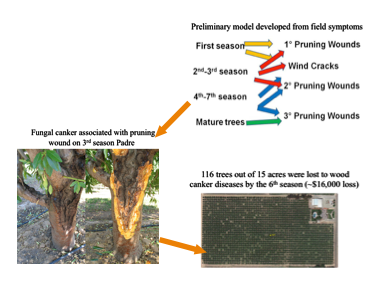 Identification and surveying of infested orchards, isolation and identification of wood canker fungi, and spore trapping. Identified pruning wounds, growth cracks, and wood breakage serve as primary points of infection. Found that spore trapping of wood canker fungi is in association with rain events. Successfully extended these initial findings to almond growing clientele in CA. 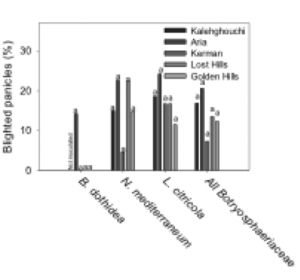 Development of a preliminary model and management practices from field observations and spore trappings. 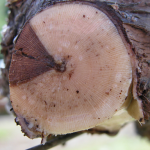 Goal – Develop a detection tool for the early stage of infection, to quickly identify infected nursery stock, and as a study tool for field-testing new pruning-wound protectants. Activities – Defined the timing and characteristics of the early stage of infection by the Botryosphaeria dieback pathogen Neofusicoccum parvum, based on spread of the infection and anatomic changes in the trunk, and differential gene expression in the leaves. Results & Outputs – Identified a set of eight grapevine genes (aka ‘molecular signature’) expressed in leaves during the early stage of infection from 0.5 to 1.5 months post-inoculation (MPI). 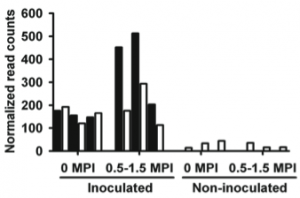 For e.g., genes VIT_00s1455g00010 (dark bars) and VIT_01s0026g02710 (white bars) are highly expressed in inoculated plants, compared to the non-inoculated control plants. Significant Outcomes & Impacts – Demonstrated ‘Proof of concept’, that the early stage of infection in the stem is detectable in asymptomatic leaves. This was first in a series of experiments, the next of which will confirm specificity of the molecular signature for possible interactive effects with drought stress and other trunk pathogens.